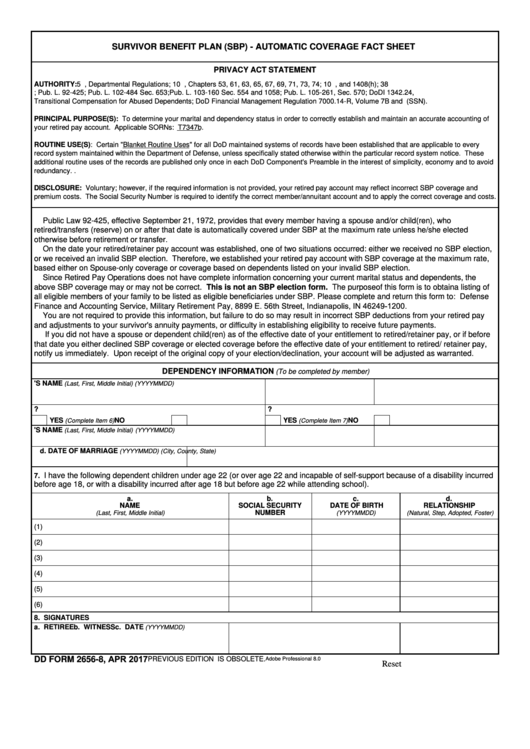 Download a blank fillable Dd Form 2656-8 - Sbp Automatic Coverage Fact Sheet - April 2017 in PDF format just by clicking the "DOWNLOAD PDF" button. Complete Dd Form 2656-8 - Sbp Automatic Coverage Fact Sheet - April 2017 with your personal data - all interactive fields are highlighted in places where you should type, access drop-down lists or select multiple-choice options. Transitional Compensation for Abused Dependents; DoD Financial Management Regulation 7000.14-R, Volume 7B and E.O. 9397 (SSN). your retired pay account. Applicable SORNs: T7347b. premium costs. The Social Security Number is required to identify the correct member/annuitant account and to apply the correct coverage and costs. otherwise before retirement or transfer. based either on Spouse-only coverage or coverage based on dependents listed on your invalid SBP election. Finance and Accounting Service, U.S. Military Retirement Pay, 8899 E. 56th Street, Indianapolis, IN 46249-1200.
and adjustments to your survivor's annuity payments, or difficulty in establishing eligibility to receive future payments. notify us immediately. Upon receipt of the original copy of your election/declination, your account will be adjusted as warranted. 5. DO YOU HAVE ANY DEPENDENT CHILDREN? before age 18, or with a disability incurred after age 18 but before age 22 while attending school).